Sciences. Reason for me to wanting to do my internship in South Korea is very simple: a long-time interest towards Korean culture and language. I wanted to see what the working life would be like in Seoul, since there are a lot differences when compared to Finland. drastic change in my environment. which I was promoting via different social medias, trying to get people to know us a little more. We got a few customers every now and then, whom were interested in learning to speak English better. I also did some translating for the upcoming March 2018 K-Pop Camp and answered bunch of emails from people who were interested in the internship or K-Pop Camp. Over all this internship has been an experience. 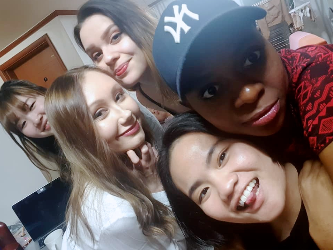 I’ve met the most amazing people from different countries, who have become extremely close to me in a short period of time. I’ve learned not only about Korean culture, but also about French, Philippine and Vietnamese cultures plus many more. My mind set has widened remarkably, which I’m happy about, since it was one of my goals when deciding to leave for Seoul. Even though it took me a little bit of time to get used to Seoul as my “home town”, I’m now leaving Seoul with a heavy heart. Even though South Korea is completely different from Finland, I’m leaving a small part of me here.